The factors that made Sunday’s race could have been the perfect weather, the flat course on the Chesapeake and Ohio Canal Towpath, or months of hard work and training. Whatever the factors were, the 10th annual Potomac River Run Marathon seemed to have the perfect combination of elements that allowed many participants to qualify for the Boston Marathon and, for many, achieve a new personal record. [button-red url=”http://youngrunner.smugmug.com/Race-Photo-Galleries/PRR-2013-Marathon-Half/i-vDjDfS6″ target=”_self” position=”left”]Photos[/button-red]Weeks before Strength Running Coach Jason Fitzgerald passed the leader at mile 24.5 at Sunday’s race, he was cheering on two of his athletes in the Boston Marathon at mile 25.5. Afterward, he went to a restaurant in Cambridge, where his phone started to ring. His family and friends had heard what had happened at the race. Fitzgerald clenched the first-place prize in the Potomac River Run Marathon. His goal in the race was to qualify for the Boston Marathon by 10 minutes. Although he had qualified before, he had never taken advantage of the opportunity. But just moments after making qualifying time, Fitzgerald said he plans to compete in the 2014 Boston Marathon. Fitzgerald said that next year’s race will be that much more special for anyone running. Albeit a chilly start, temperatures rose to what many runners considered perfect. Along with “Air Quality Awareness Week,” the marathon celebrated “World Laughter Day,” which prompted race director Jay Wind of the Safety And Health Foundation to tell jokes at the starting line. Kirby Mills joined the many athletes who accomplished a qualifying time for the 2014 Boston Marathon and a new personal record. Prior to competing in the race, Mills, who serves in the Marine Corps and is currently stationed at Quantico, missed a Boston qualifying time in March by only 34 seconds. Mills is a member of the National Marathon Maniacs group, which has a minimum requirement for members to run three marathons every 90 days. 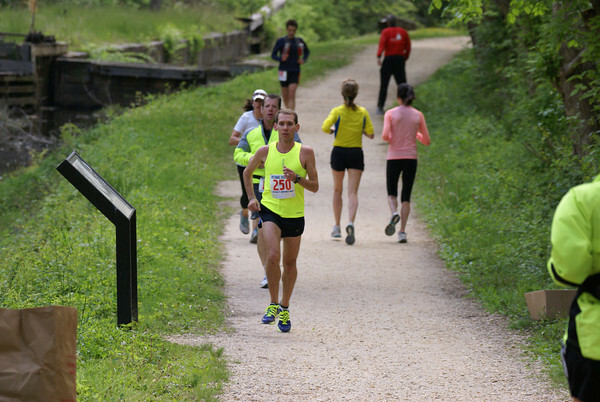 The Potomac River Run Marathon marked Mills’ 54th marathon. The twice out-and-back course on the sandy—but sometimes rocky—C&O towpath had the potential to be a mental challenge for some. But Chip Warfel and his Mid Maryland Triathlon Club teammates, Heather Beutel and Dan Mooney were not fazed. In fact, Warfel said that he liked the two-time turnaround course. At the beginning of the triathlon season, Warfel, Beutel and Mooney all wanted to make the qualifying time for the Boston Marathon—and they did. Warfel said that after the Boston Marathon bombings, he was more motivated to qualify for the race. “I really want to be there next year to show that no one is going stop anybody from doing this,” Warfel said. Warfel’s teammate, Deb Taylor, who served as a pacer during the race, will also join her teammates of the Mid Maryland Triathlon club to compete in the 2014 Boston Marathon. The Safety And Health Foundation Board of Directors agreed the day after the Boston Marathon bombings to donate $1,000 to the One Fund Boston, an organization that was established to assist the victims of the bombing at the finish line.